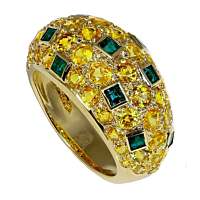 Vibrant yellow sapphires and deep green emeralds come together to create this Van Cleef & Arpels 18k yellow gold dome style ring. Van Cleef and Arpels jewelry was first designed in 1896 by by Alfred Van Cleef and Salmon Apels in Paris, where its headquarters remain today. Van Cleef and Arpels jewelry is noted as the first luxury brand to use an invisible setting in it's jewelry. For those lusting after the beauty of Van Cleef Arpels high jewelry, pre owned Van Cleef jewelry and Van Cleef and Arpels estate jewelry are great Van Cleef jewelry options. You are destined to find something stunning among the beautiful Van Cleef Arpels & Arpels jewelry pieces available through our pre owned Van Cleef jewelry and Van Cleef and Arpels estate jewelry options. 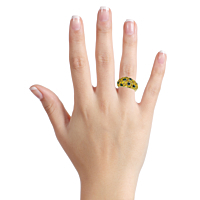 Van Cleef jewelry is in a class of elegance all its own.